But young people are not consistently liberal or progressive. In 1984, US voters under 30 decisively chose Ronald Reagan, and as recently as 2000, they split their votes evenly between Bush and Gore. This is a reason, by the way, for both of our major parties to contest the US youth vote. In 2012, a plurality of young White voters chose Donald Trump over Hillary Clinton. (Her lead among all youth was due, in large measure, to the racial diversity of the Millennial generation.) Among young Trump voters, many expressed concerns about foreign influence on US culture and political correctness. Meanwhile, Marine Le Pen did quite well among young French voters. In the second round, she seems to have drawn about one third of youth, the same proportion as in the population as a whole. For the first round, Yascha Mounk provides the chart below. A plurality of French voters under-25 chose the candidate of the left, Jean-Luc Mélenchon. However, Le Pen’s strongest support came from voters under 35, and particularly those between 25 and 34. 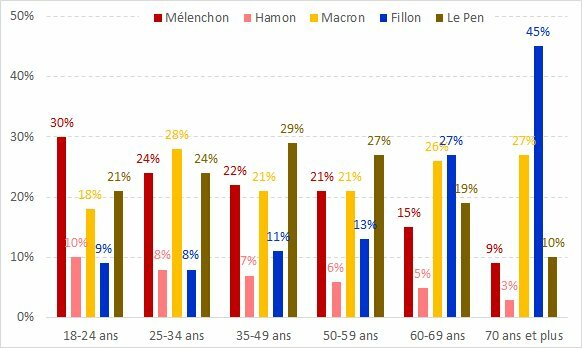 Emmanuel Macron, the ultimate winner, performed worse among 18-24s than in any other age range. At the [FN] conference, smartly dressed, articulate young activists were among those pushing Le Pen’s message most fervently. They hammered home the dangers of multiculturalism and Muslims who “segregate” themselves from secular French society; they pronounced themselves enthusiastically in favor of a “Frexit” from the European Union. Like Dieulafait, who joined the FN at 16, they want a government that puts French citizens’ needs before those of immigrants, and they are not ashamed to say so. Importantly, this article noted that the National Front is way ahead of other French parties at advancing young candidates for office at all levels. It is always right to encourage youth engagement in democracy and to support young people to form their own view of issues and values. In a country like the US, it’s also important to boost their turnout levels because they (and their interests) are under-represented. Of course, if they prefer parties to the right of center, that is their prerogative. But progressives, liberals, mainstream conservatives, and libertarians shouldn’t romanticize youth as some kind of natural base for their movements or assume that generational change shifts the world toward democratic and cosmopolitan values. If a society harbors nationalistic, xenophobic, or downright racist views, those values will probably transmit to each new generation. I love Hannah Arendt’s fundamental insight that only “the birth of new men and the new beginning, the action they are capable of by virtue of being born … can bestow upon human affairs faith and hope.” In other words, because new human beings are always coming into the world, we can hope that things will change for the better. But there’s certainly no reason to assume that this will happen on its own. See also: Millennials’ political opinions: insights from the new CIRCLE poll; the Millennials and politics; in what ways are Millennials distinctive? ; and the Millennials’ political values in context.